For up to the minute info on shows click HERE. April 16th 2005 - at the Harmony Sweet in Simi...Mike Sinister's Birthday Bash!! With Keep Fighting, OTI, Wired-Shut, the Homesick Abortions, and more. April 2nd 2005 - at the Loft in Ventura with Charged, Keep Fighting, Total Resistance, MRSD, Homesick Abortions, Wired-Shut, Take Your Best Shot, and Onewordsolution. 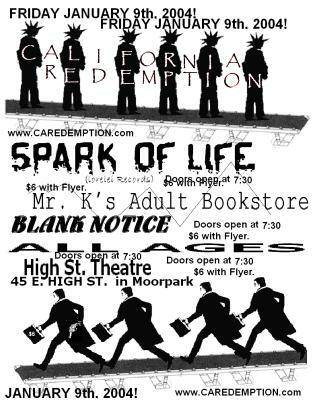 March 11th 2005 - at the Harmony Sweet in Simi Valley with MRSD, Eat the living, and more. February 25th 2005 - at the cobalt with Death Valley Meth Lab , RFD, The Subjects, The Downfall, Assault-86, and Onewordsolution. January 29th 2005 - at the American Lesion Hall in Ventura with the Angry Samoans. December 20th 2004 - at the Harmony Sweet in Simi Valley. Mr. K's Adult Bookstore, Homesick Abortions, The Downfall, and Start the Panic. November 26th 2004 - at the Loft in Ventura with Dr. Know, Charged, LOKi, heavy Artillery, and KEEP FIGHTING! October 29th 2004 - at the Loft in Ventura with YOUTH BRIGADE!!!!! July 17th 2004 - Nardcore 20th Anniversary Show! At the world famous Skate Palace (Address coming soon). $10, starts at NOON. Be there EARLY. Here's The line-up so far! 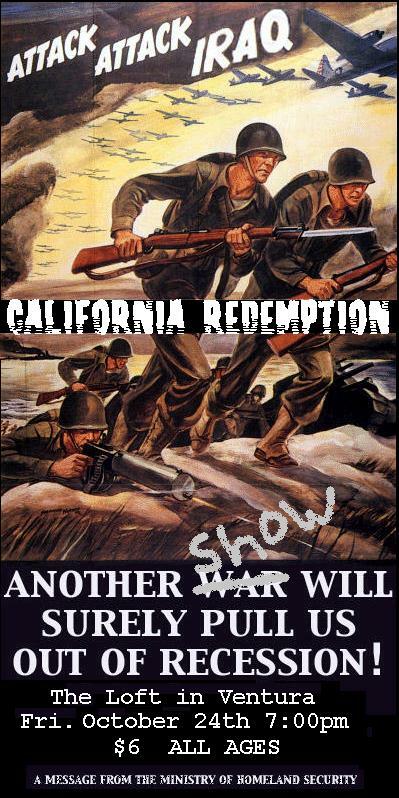 May 21st 2004 - at The Harmony Sweet in Simi Valley with Heavy Artillery, Destructive Liberty, Keep Fighting, and The Last Priority. April 2nd 2004 - at The Loft in Ventura with Caught Off Guard, Damaged Goods, Keep Fighting, and Charged. March 27th 2004 - at STUDIO S in North Hollywood with Broskey's Revolt, American Conflict, RFD, The Scuffs, Homesick Abortions and Freedom Kills. February 7th 2004 - at The Drink in Ventura with Caught Off Guard, and No Patience. January 10th 2004 - at the Ventura Theatre in Ventura. With Caught Off Guard, The Assault, and Nylus. January 9th 2004 - at the Theatre on High St. in Moorpark. With Spark of Life (Lorelei Records), Mr. K's Adult Bookstore, and Blank Notice. November 28th 2003 - at STUDIO S in North Hollywood with Dr. Know, Product of Suburbia, C.O.F, Caught Off Guard, Famous Tea, and Keep Fighting! October 31st 2003 - at the T's HOUSE with Ill Repute, Caught Off Guard, Rejected Society, and The Last Priority. October 24th 2003 - at the THE LOFT at SKATE STREET in Ventura with Calcutta, Straight Forward, and more. September 27th 2003 - at THE LOFT at SKATE STREET in Ventura with P.O.S, Knockfirst, Surface and Lorene Street. September 17th 2003 - at the HARD TO FIND SPACE in Goleta with Rat Romance and Form of Rocket. September 12th 2003 - at THE LOFT at SKATE STREET in Ventura with P.O.S, and The Bombshells. July 24th 2003- at the COBALT CAFE in Canoga Park with P.O.S. July 12th 2003 - at the HARMONY SWEET in Moorpark with Caught Off Guard. July 11th 2003 - at the CIA in N. Hollywood with Caught Off Guard. June 14th 2003 - at a CHURCH in Ventura with Loki, Insignia, and Odball. June 13th 2003 - at the NARDCORE MANOR in Oxnard with Caught Off Guard, Rejected Society, Burning Dog, and Last One Standing. June 8th 2003 - at the COBALT CAFE in Canoga Park. BATTLE OF THE BANDS. 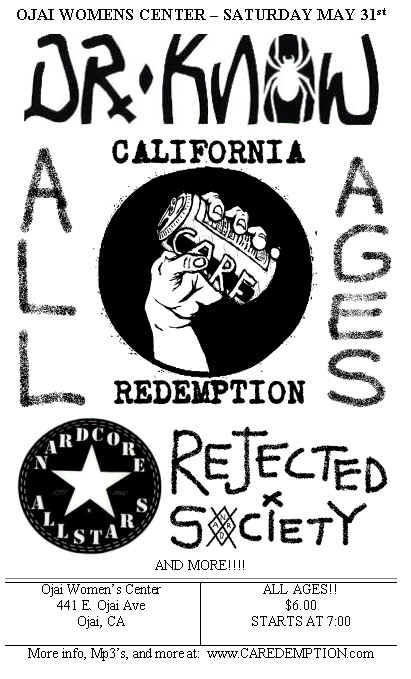 May 31st 2003 - at the OJAI WOMEN'S CENTER with Nardcore All-Stars, Dr. Know, and Rejected Society and The Rotted. May 24th 2003 - at SKATELAND in Whittier...It was Skratch magazines battle of the bands. MAY 10th 2003 - The C.I.A. - California Institute of Abnormal Arts in North Hollywood. 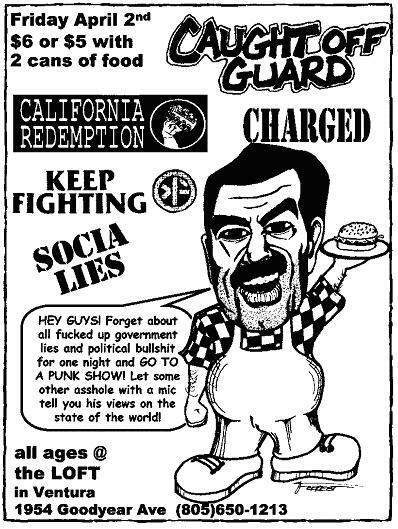 APRIL 13th 2003 - COACH HOUSE in Santa Barbara with Nardcore All-Stars, ILL REPUTE, the Bad Samaritans and Rejected Society. MARCH 30th 2003 - THE POUND in San Francisco with THE SCARVES. MARCH 28th 2003 - DADDY - O's HOT ROD BAR in Sacramento with UNDERCLASS! MARCH 27th 2003 - ANARCHY LIBRARY in Downey. MARCH 22nd 2003 - at EASY STREET ICE ARENA with C.O.F. PUNK ROCK ON ICE!! MARCH 8th 2003 - at THE OTHER PLACE. FEBRUARY 21st 2003 - at the PARK! It got shut down early and LOKi couldn't play. FEBRUARY 7th 2003 - at the COBALT CAFE with LOKi and others. JANUARY 16th 2003 - at MANNY'S PLACE with The Rotted and Stink Palm!! Special appearance by The Mouse and the Moose! 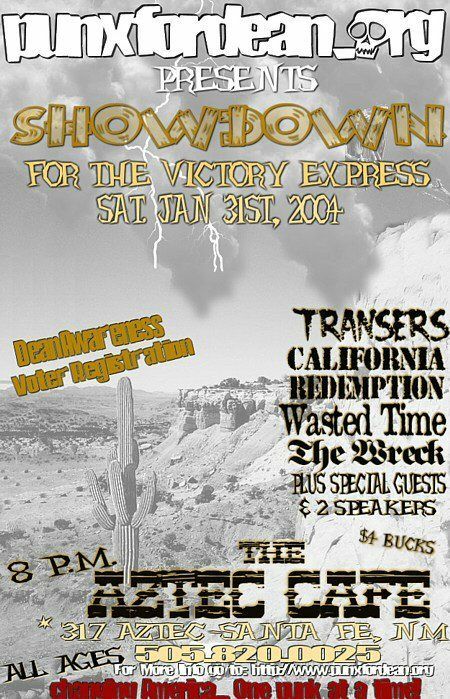 JANUARY 2nd 2003 - at the WHISKY-A-GOGO with...DROP 6, JAMES MARSHAL, and The wreck. DECEMBER 29th 2002 - at MIKE SMITH'S HOUSE with RACQUETTE. DECEMBER 26th 2002 - at the OJAI WOMEN'S CENTER with ILL REPUTE!!!!! KEEP FIGHTING, C.O.F., and Mr. K's Adult Bookstore. .
You can right click on some of these and "save target as" to have a bigger copy.